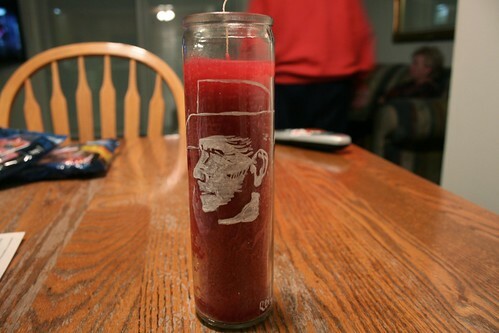 A few months ago, I bought tall glass candles at Wal-mart that resembled the ones you usually find with religious pictures wrapped around them. I painted them with various stencil designs that I acquired from a book of clip art from the 30s-50s. The one I created today (above) was actually an image of a younger man, but somehow my interpretation made him appear a bit older. I decided to name him Dan. I think the candles will make a nice addition to my Dia de los Muertos altar I'm making this weekend for the Campa Creatives craft party.